Rewind to Fall 2014 and I was sitting in a room in Oxford, England giggling, enjoying deep academic and philosophical conversations, chatting about the intense amount of reading and writing, or discussing the next quickly approaching deadline with my roommates Abbie and Mary. We adventured together, cried together, learned the quirks of England together, ate together, biked together, had Thanksgiving together, and really became each other's family. Mary was dating her *completely wonderful,* now husband, Rob. And I was dating my *equally wonderful,* now husband, Andrew - while Abbie was, in her words, "living her best single life." And she really was. For her this looked like mastering all of her tutorials (Oxford's lingo for classes), crushing it in a University a cappella group, and jetting off to the next country and hostel on her list whenever she could. Even then as these moments and memories were unfolding before my eyes I could tell there was something so beautiful about that season. I knew years later I would still be looking back on these memories fondly. With all of the difficulties accompanying our time abroad, those two beautiful souls I had the privilege of calling roommates, quickly became forever friends. Each of us uniquely different in our passions and personalities. To say I'm grateful for the time would be a massive understatement. Fast forward past mine and then Mary's wedding, and Abbie began studying at Yale, just a short drive from me in Connecticut. It was at Yale Divinity School where she and Armando first met and after some time of friendship and a season of falling in love, well, I guess you could say the rest is history. I was so delighted to find out Abbie was engaged because I had seen her embrace and live out her single years beautifully and knew that somewhere out there was a guy who would compliment her and see her for the gem that she is. I met Armando for the first time at their engagement session and as the evening went on I was just so happy to have the opportunity to get to know him and to see them interact as a couple. They treated me to dinner after our sunset session on the beach and it was another one of those moments I know I'll cherish forever. It's an amazing experience to document love stories, but it's even more meaningful and downright cool when it's a sweet friend that you get to watch be in love and be loved so well. Andrew and I can't wait for all of the double dates we have in the future with these two. 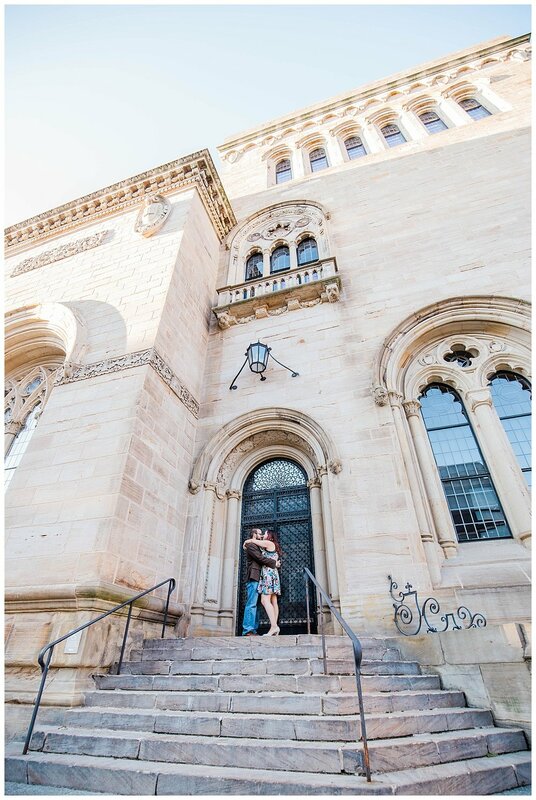 My one request for anyone reading this would be to listen to the song "How Long Will I Love You" by Halcyon Days as you're looking through these photos from their engagement session - there's just something about putting some music to a gallery. Congratulations, you two! My hope is that you enjoy this season in life and that it's one filled with intense fits of laughter, talks about the future, and that you enjoy walking into it boldly hand in hand, side by side.